Steps to use ATVMs for buying ticket Steps to use CVMs for validating tickts. 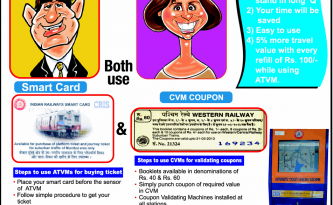 Benefits of using ATVMs & CVMs Quick and convenient way to buy your railway ticket. 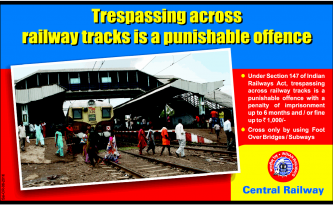 Trespassing across railway tracks is punishable offence. 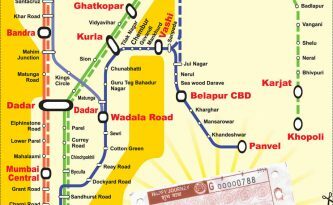 under section of 147 of Indian Railways Act, trespassing across railway tracks is punishable offence with a penalty of imprisonment upto 6 months and or fine upto Rs. 1000. Cross only by using Foot Over Bridges/Subways. Michelle and Barak Obama doing Koli dance in Mumbai. What more you can expect from an American President? First Lady Michelle Obama picked up the dance moves of kids so fast.